Houston, Texas is the largest city in the state of Texas and fourth-largest in the United States and is the county seat of Harris County. 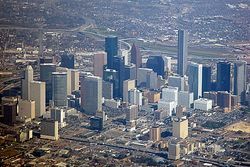 Houston is a major cultural center, the largest economic center of the Gulf Coast of the United States region, and the seventh-largest metropolitan area in the U.S. with a population of 5.3 million in the 10 counties of the greater Houston area. In 2006, the Houston metropolitan area ranked first in Texas and third in the U.S. within the category of "Best Places for Business and Careers" by Forbes. Forty foreign governments maintain trade and commercial offices here and the city has 23 active foreign chambers of commerce and trade associations. Twenty foreign banks representing 10 nations operate in Houston, providing financial assistance to the international community. Houston is recognized as a global or "world city" by the Globalization and World Cities Study Group & Network. The city has an active visual and performing arts scene as Houston is one of the five U.S. cities that offer year-round resident companies in all major performing arts. The Houston Theater District is ranked second in the country for the number of theater seats in a concentrated downtown area per capita. The city is home to NASA's Lyndon B. Johnson Space Center—where Mission Control Center is located—giving Houston its official nickname of "Space City." This page was last modified on 5 November 2009, at 21:16.